Since its opening, Waubonsee Community College's downtown Aurora Campus has brought new life to the heart of Aurora's downtown. It has transformed an entire block of underused buildings into a new state-of-the-art multi-use educational campus. In just a year, it has served nearly 9,500 students, while also hosting numerous educational and municipal events. "Waubonsee's downtown Aurora Campus offers Aurorans a wealth of opportunities," Waubonsee President Dr. Christine Sobek said. "No matter where you're starting on the ladder to educational success, this campus provides the knowledge and support you need to meet your goals." 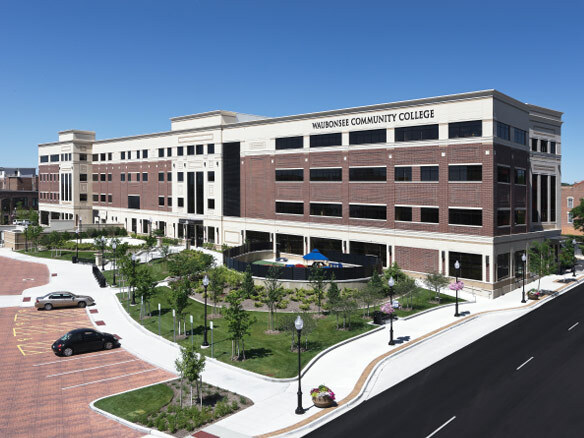 The new 132,000-square-foot campus provides comprehensive educational services, so that students can now begin and complete their associate degrees and certificates in downtown Aurora. This facility serves growing demand: Enrollment has been increasing 20 percent annually, while credit course semester hours have increased even more rapidly, by 122 percent. Students at the new campus are now learning in specialized classrooms including chemistry and biology labs, numerous computer classrooms, a certified nurse assistant (CNA) lab, a sign language and interpreter training lab, among other unique learning spaces. Direct, on-site access to student services is another big change for the new campus. Offering a "one-stop shop" model, new and returning students can now visit with admissions, counseling, financial aid and registration to plan their educational careers at the college. These areas have seen an increase of more than 40 percent in student traffic compared to the former Stolp Island campus. Greater access to student services allows more students to utilize the critical resources they need to succeed. "In terms of economic impact, few things make as much difference to the success of a city as a well-educated population," Aurora Mayor Tom Weisner said. "Waubonsee's new downtown Aurora Campus not only increases our city's marketability by increasing the education of our workforce, but the campus itself is also an economic beacon, showing the vitality of downtown Aurora to future investors and entrepreneurs." Waubonsee's new Aurora Campus not only offers a diverse array of classrooms and offices. It also provides a tech-centered library, full-service bookstore, early childhood center, grab-and-go café and coffee bar, and media-ready multipurpose room. The multipurpose room, which is available for rent for professional meetings, has become a valuable asset for the downtown community. "Waubonsee is truly our community's college," said State Rep. Linda Chapa LaVia. "Providing an education to those who need it most benefits the individual, the city, the region, the state and the entire country. This new campus shows Waubonsee's commitment to serving its community with life-changing educational opportunities." Read more on the first anniversary of the Aurora Campus here.